Stan & Jack are back! In fact, you may be noticing a trend. 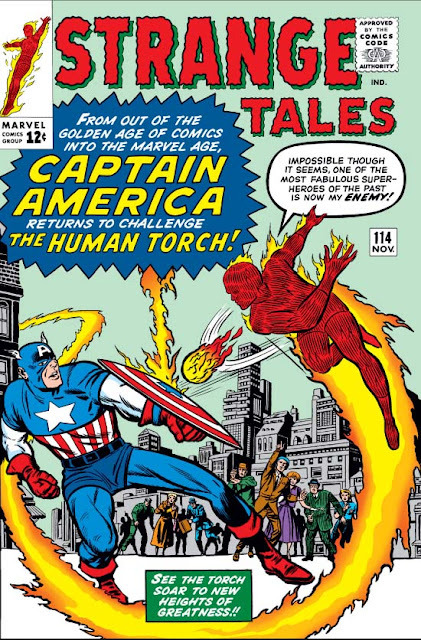 The previous week saw the release of Journey into Mystery #97 and Tales to Astonish #49 - comics which featured the return of Jack Kirby on art, as well as Stan Lee doing full script on those titles for the first time. And the same occurs here! The only difference is that, unlike the other two, this story doesn't seem to herald any major change for the series. The return of Captain America! Well ... not quite. But hey, wait! Captain America?! Really?! Um ... no, actually. As it turns out, it's really just a disguise for the Torch's enemy The Acrobat, who once fooled Johnny into joining him in a ridiculously-named partnership. But make no mistake - this was deliberately a test-run for the real thing, as Stan makes explicit in the story's closing captions. And why not? 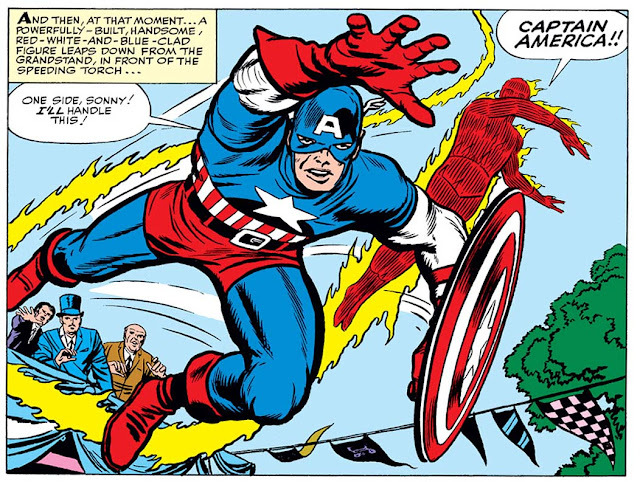 After all, Stan & Jack updated the Human Torch when they were creating the Fantastic Four, and very quickly found a way to bring back the Sub-Mariner as well. So Stan must have surely been pondering the third member of that Golden Age trifecta - who Jack Kirby co-created, after all, way back in 1941. Obviously, the readers would in fact respond most positively! You certainly can't say Stan didn't know the hard sell! This is Mordo prank calling. It's how he gets his kicks. Although it's not the most remarkable story for Doctor Strange - certainly it's the weakest of these first three - there are still a number of noteworthy developments. Baron Mordo appears for the second story in a row, confirming his position as Strange's archenemy; their master is now called the Ancient One instead of just "the Master"; and we're introduced to Victoria Bentley, a now-forgotten supporting character who would nevertheless go on to have ties not only to Doctor Strange, but also the Black Knight, Psylocke and Captain Britain. One of the more memorable moments, though, comes from the unintentional hilarity which would often arise when an overseas locale was written by an American. In this particular case, a cabbie drops Strange off in "a dark, foggy London street" ... which just happens to contain Lord Bentley's castle. Really? A castle in London? Tell me, is that on the Piccadilly Line? Or closer to the financial district? Maybe not the most memorable return, but it only goes up from here.